ArcGIS Living Atlas of the World provides foundation elevation layers to support your work in 2D and 3D. Over the last couple of years, Esri has been developing World Elevation Services primarily from best authoritative data from open sources and contributions to the Esri Community Maps for Elevation program. 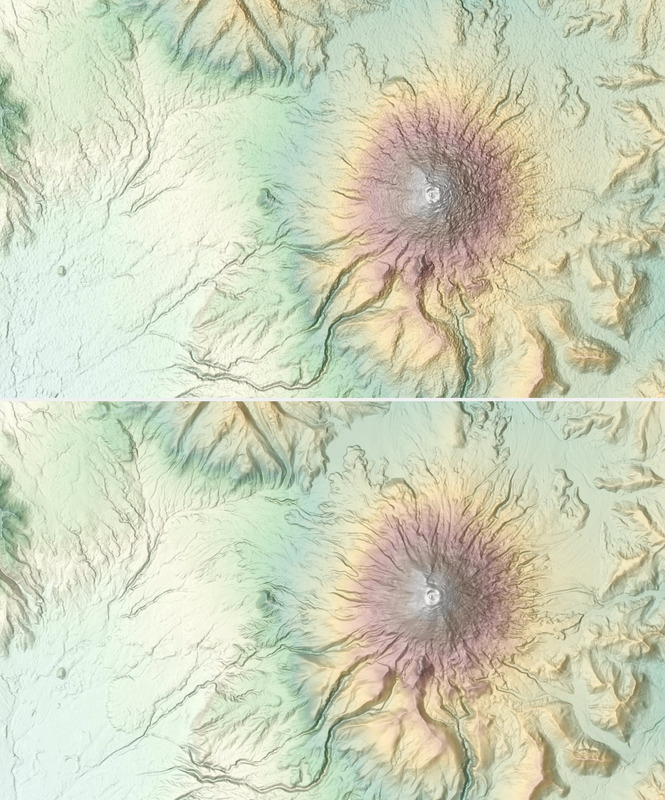 We are glad to announce that we are adding global elevation data from Airbus Defence and Space to further enhance Esri Elevation Layers (Terrain and TopoBathy) and Tools (Profile, Viewshed and Summarize Elevation). WorldDEM4Ortho, which is based on the global WorldDEM dataset, has a resolution of 0.8 arc second (approx. 24 meters) with a vertical accuracy of ~ 4 m (LE90%)* on a global scale. Covering the entire earth’s land surface (excluding the countries of Azerbaijan, DR Congo and Ukraine), this is the most consistent and accurate satellite-based elevation model on a global scale. This dataset brings many improvements over areas with SRTM 30 m coverage and areas above latitudes of 60 degree north and south. This dataset is now available in world elevation layers and tools to all ArcGIS Online subscribers. 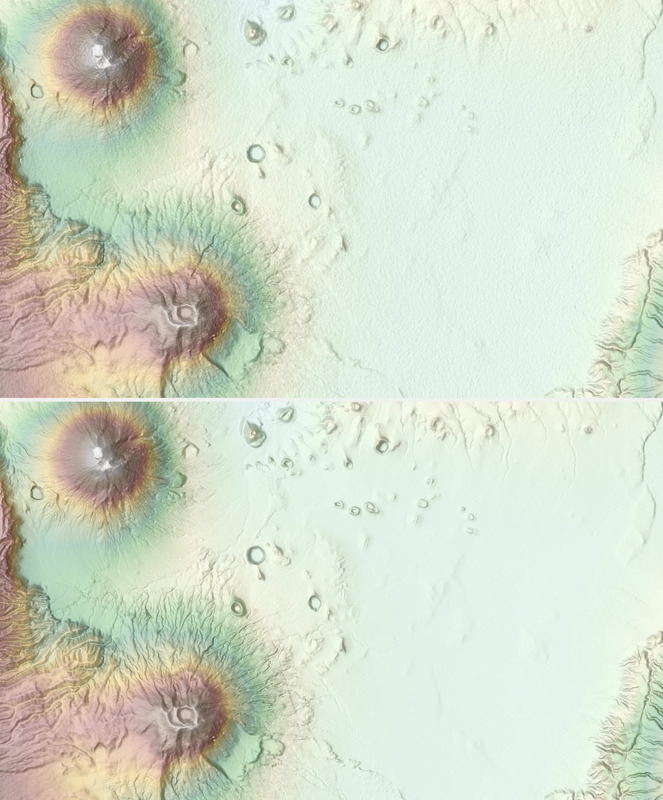 Let’s see few examples showing enhancements over SRTM 30 m.
The world elevation image services (Terrain and TopoBathy) are a collection of multi-resolution and multi-source elevation data that can be used for visualization (such as multi-directional hillshade, tinted hillshade) and analysis. 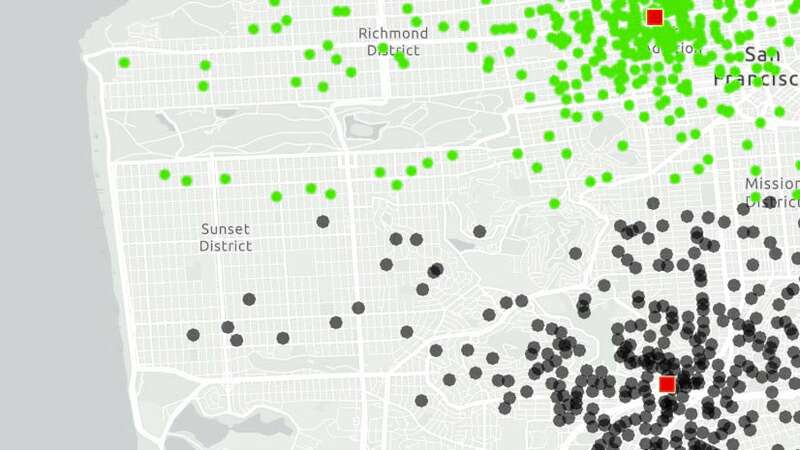 When using for visualization, the service will automatically display the data from best source at a given location, thus providing a seamless user experience. With this update, Airbus WorldDEM4Ortho will take priority over SRTM when rendering visualizations. While doing analysis in ArcGIS desktop clients (Pro or ArcMap), you need to choose a dataset from the service depending upon your analysis requirements. These services being dynamic image services provides the ability to make a request in user defined coordinate system, cell size and extent which make these suitable to use for analysis. Each dataset in these services has a unique identifier and a query can be defined based on ProductName or Dataset_ID. For example, a definition query of “ProductName” = ‘Airbus_WorldDEM4Ortho_24m’ will filter data pertaining to the Airbus WorldDEM4Ortho grid only. To make a request in user defined parameters, use the Make Image Server Layer geoprocessing tool. This tool generates a temporary layer that can be used as an input in other geoprocessing tools to perform analysis. Airbus WorldDEM4Ortho is also rolled out in Elevation Analysis Tools (Profile, Viewshed and Summarize Elevation) and can be invoked in these tools by selecting 24 m option from the drop-down menu of DEM Resolution parameter. 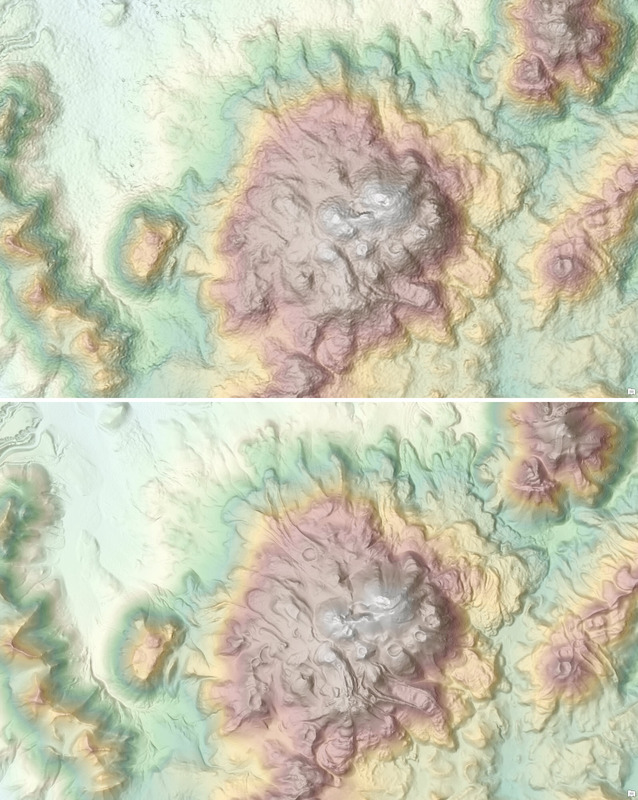 These updates will also be rolled out to other world elevation derivative products – Elevation 3D (Terrain3D and TopoBathy3D), World Hillshade and World Topo Base over the next month or so. Stay tuned! For more information about the various data sources available in World Elevation services, check out Elevation coverage map. 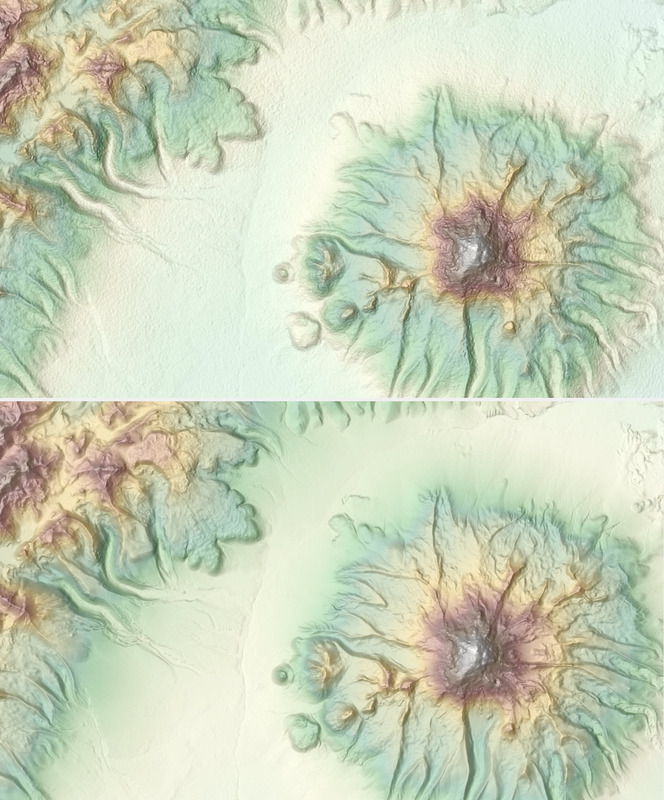 Esri will keep improving World Elevation Services, Tools and derivative products by including high resolution data from open source and Esri Community Maps program. Additionally, to contribute high-resolution elevation data to Living Atlas of the World, check out the Esri Community Maps for Elevation program. * Excluding urban areas which are flattened (DTM like areas), area of Antarctica and areas where substituted datasets are used. 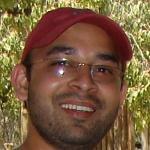 Rajinder has more than 15 years of experience in GIS and Remote Sensing. He came to Esri about 11 years ago and has worked with various teams in different capacities. In his current role, he leads the community elevation program at Esri and has wide experience in cartographic visualization, image processing, databases and geo-processing. By virtue of his strong research interest in terrain visualization, Rajinder has developed a multi-directional hillshade (esriurl.com/NextGenHillshade) algorithm to improve terrain visualization in Esri basemaps, which is also available as part of world elevation layers. 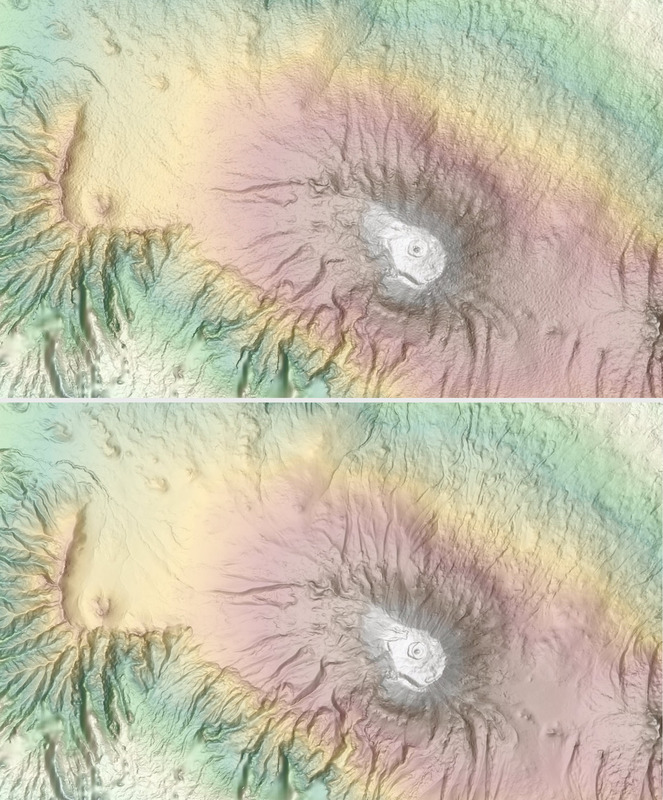 He has also developed a fusion technique (esriurl.com/NAGIfusion) which maintains details and colors when integrating colored rasters with hillshades. Rajinder holds a Master of Science degree in Geoinformatics from the International Institute for Geo-Information Science and Earth Observation (ITC), The Netherlands, and a Bachelor of Science degree in Urban & Regional Planning from GND University, Amritsar, India.